When I get the time, it is great to have a walk round London without any fixed purpose other than look at the buildings, shops, streets and people. I always have a camera with me to record how London continues to change. Many of these shops and businesses have long since disappeared, however surprisingly a number still remain and thankfully many of the buildings have survived. This was only thirty years ago, but in some ways, a very different City. To start with, this is the shop of Amos Jones, theatrical chemist on the corner of Drury Lane and Long Acre, Amos Jones has long since disappeared however the building is still there and looking much the same. 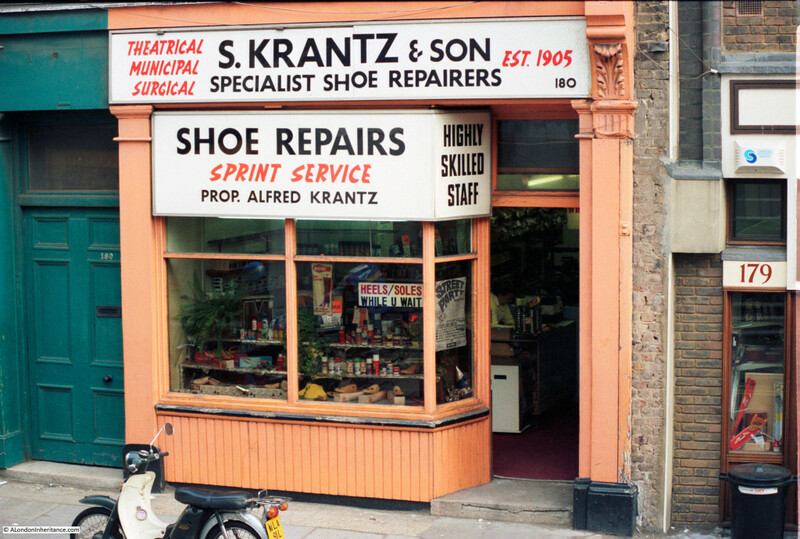 S. Krantz & Son, Specialist Shoe Repairers, 180 Drury Lane. Another closed business, but the building remains. 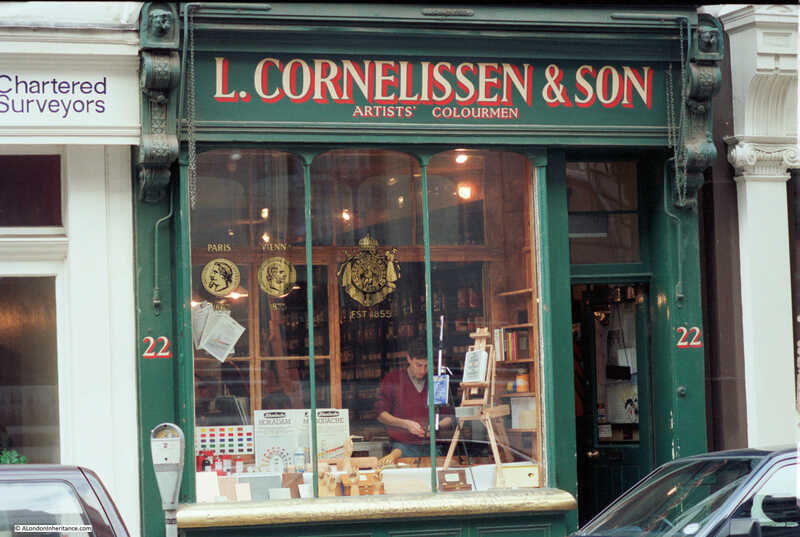 L. Cornelissen & Son, Artists’ Colourmen in their original shop in Drury Lane. 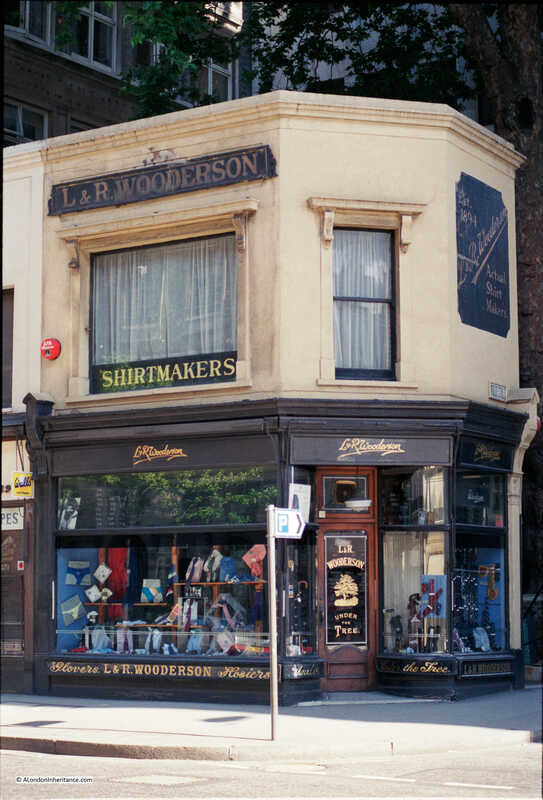 The business is still going and is now located at 105 Great Russel Street. The photo also has one of the parking meters that were so common on the streets in the 1980s (on the left, underneath the number 22). Funny how what was so common on the streets can disappear without really being noticed. 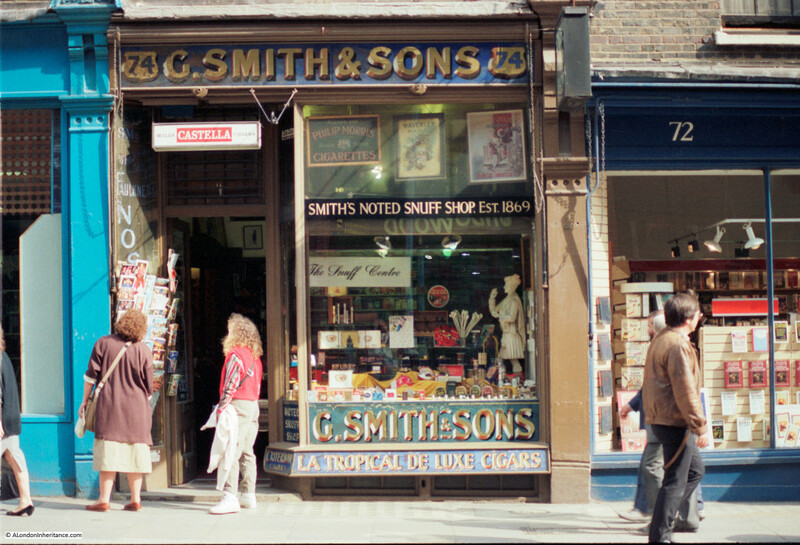 G. Smith & Sons – Smith’s Noted Snuff Shop Est 1869 at 74 Charing Cross Road. Lasted for over 120 years, but now closed. The building remains the same. 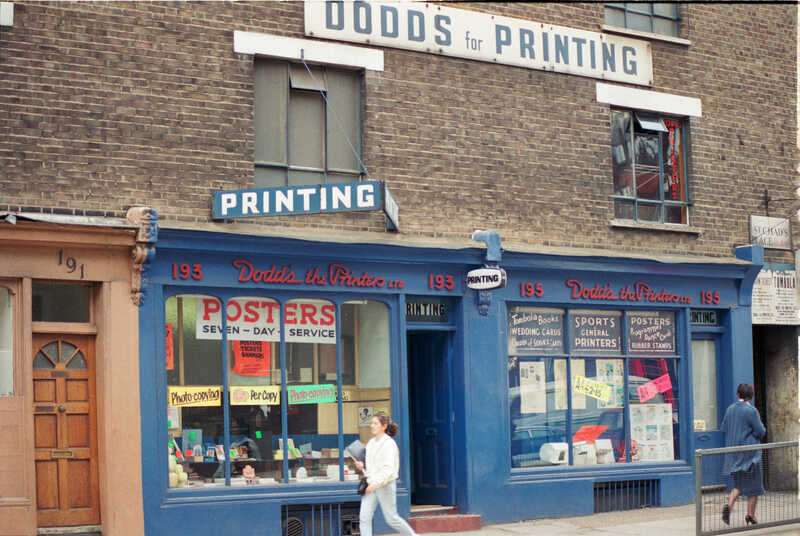 Dodds the Printers, 193 King’s Cross Road. Again, closed but the building is still much the same. 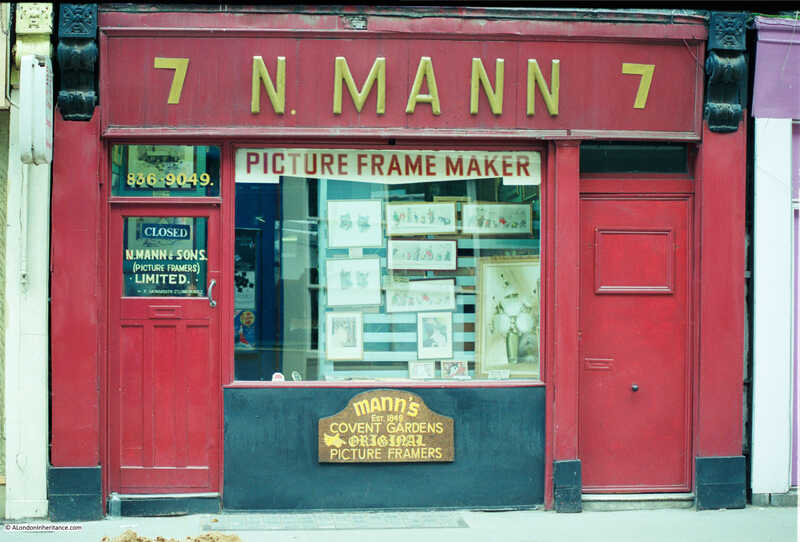 Covent Garden now and N. Mann, Picture Framers, closed many years ago. Into the City, and the corner of Wood Street and Cheapside. The building is still there, but L & R Wooderson, Shirtmakers, have been replaced by a gift card shop. 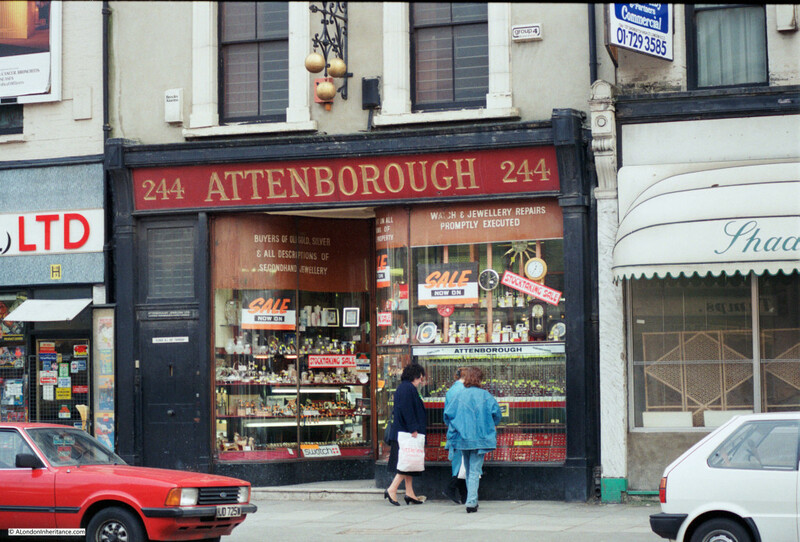 Attenborough Jewelers, 244 Bethnal Green Road. The past 30 years must have been good to them as they now occupy the building to the right as well as the original building. 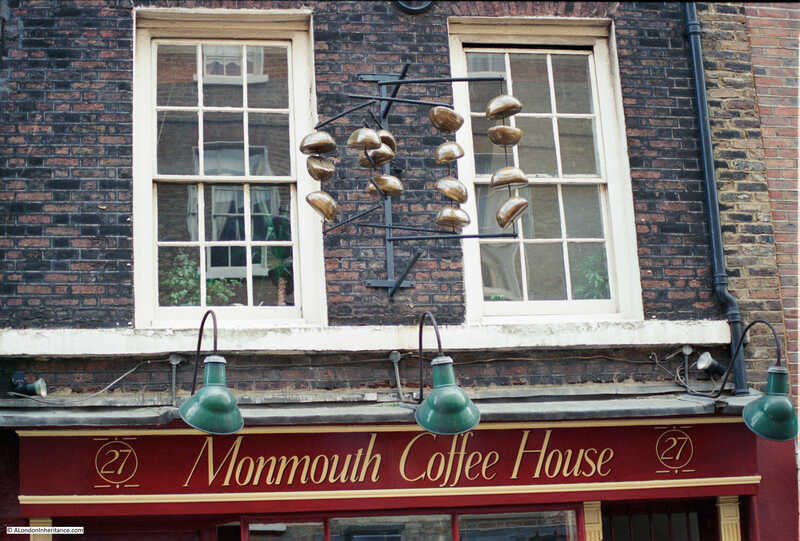 The Monmouth Coffee House at 27 Monmouth Street, Covent Garden. Still at the same location, but now called the Monmouth Coffee Company. Unfortunately the impressive display of coffee beans hanging above the shop are not there now. 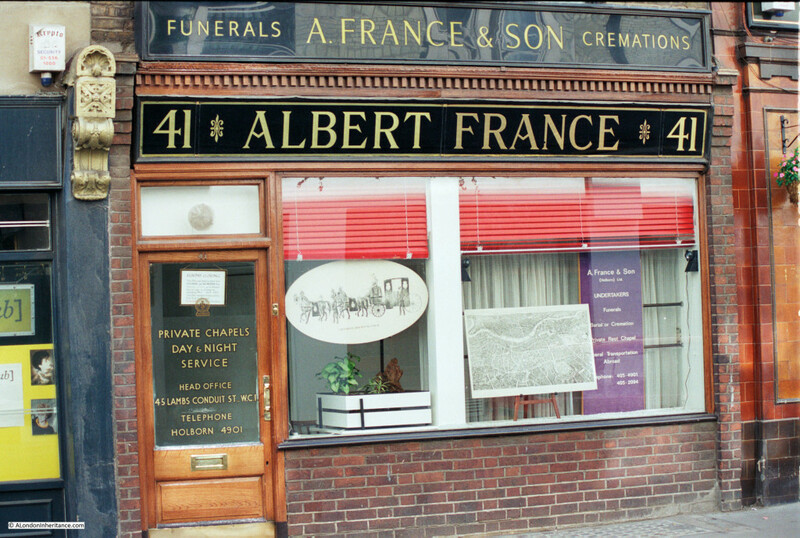 Albert France & Son, not sure where this photo was taken, however they are still in business and based in Lamb’s Conduit Street. James Smith & Sons, 53 New Oxford Street. Umbrella manufacturers since 1830. Still in the same shop with the same signage as back in 1986. 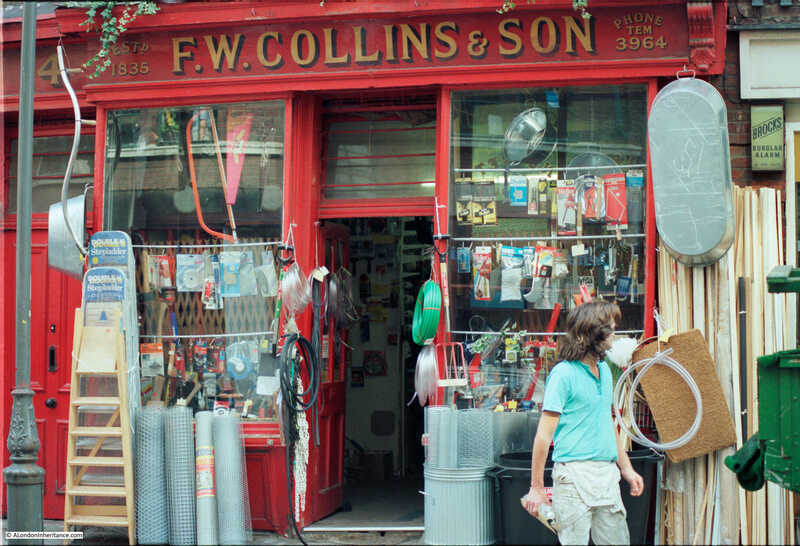 F. W. Collins & Son, 14 Earlham Street, Covent Garden. Run by seven generations of the Collins family, with each first-born son always being named Fred to ensure the continuity of the business. Closed around 2006. 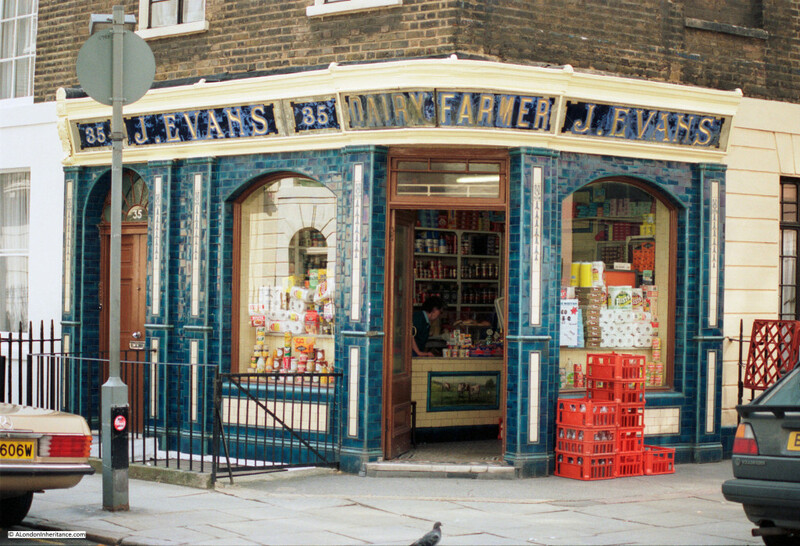 J. Evans, Dairy Farmer on the corner of Warren Street and Conway Street. The shop has long closed, however the exterior decoration has remained and the shop is now a cafe. 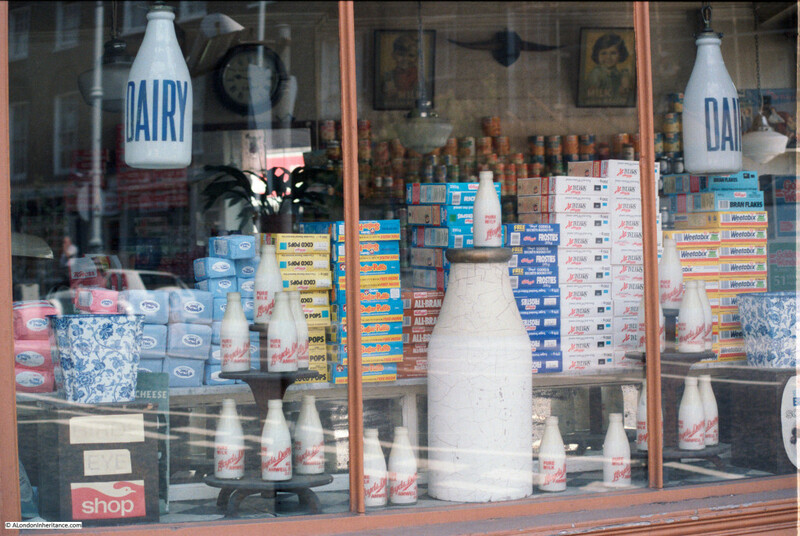 LLoyd and Son, Dairy Farmers on the corner of River Street and Amwell Street. The shop has closed, but the building and the original exterior decoration is still in place. 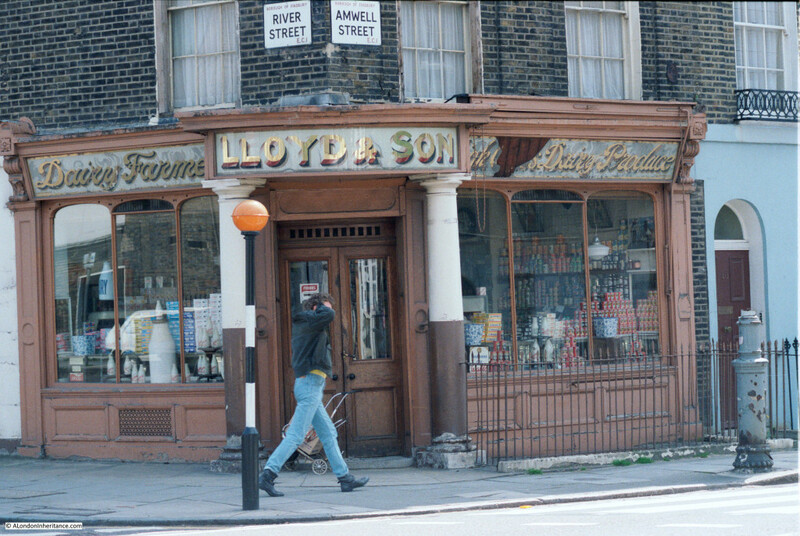 Another photo of Lloyd & Son showing one of the shop windows. Corner shops like this just do not exist anymore. Syd’s Coffee Stall, opened in 1919 and still going strong on the corner of Shoreditch High Street and Calvert Avenue. Did not make a note of the location of this building – original signs on the walls. Do not recall having seen this building in recent years. B. Flegg in Monmouth Street. I suspect these signs are not there anymore as I do not recall seeing them when I last walked down Monmouth Street as I would have taken another photo. 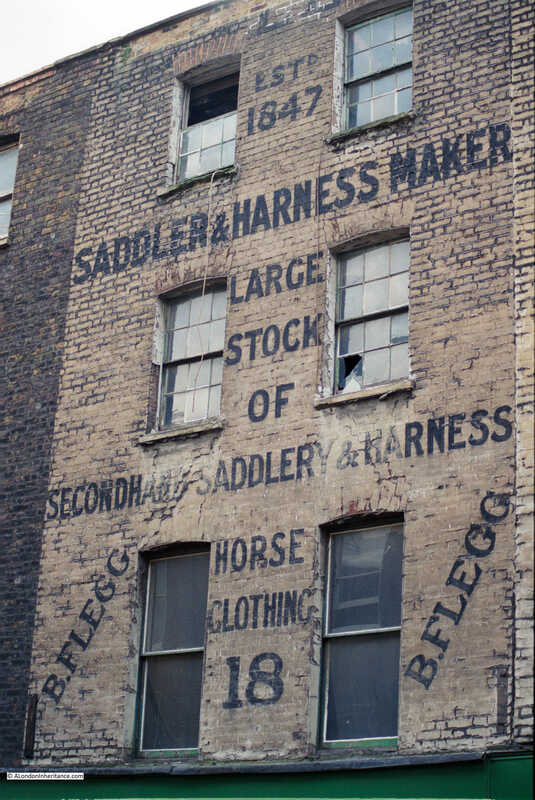 Advertising signs on building on the corner of Cambridge Gardens and Ladbroke Grove. The building is still there (much cleaner now) but the signs have gone. 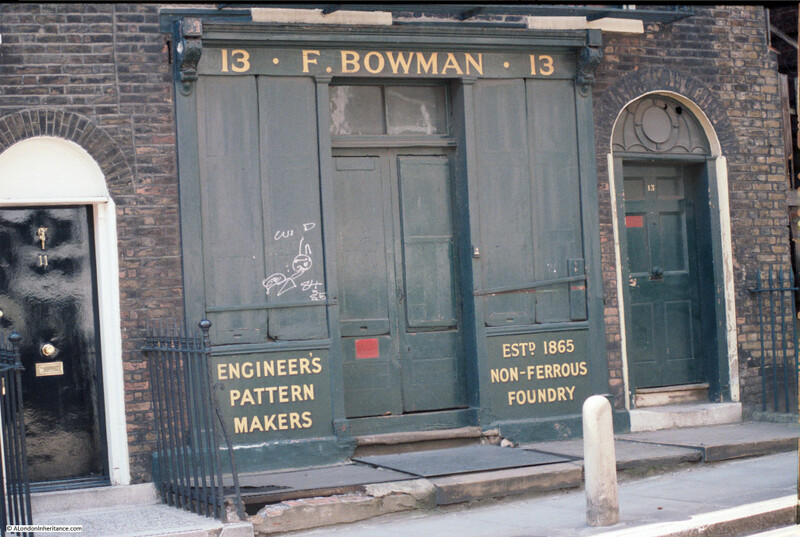 F. Bowman, Engineer’s Pattern Makers, 13 Amwell Street. Although the business has long since closed, the shop front is still in place. London is a fantastic city to walk, having a few hours to go on a walk with no clear direction and turning down streets at random just to see what is there often reveals so much about the city. Hopefully now that the lighter evenings are here with the hope of better weather, there will be plenty of opportunities for more long, random walks. This entry was posted in London Photography, London Streets and tagged 1980s, London Street Photography on March 27, 2016 by admin. Another interesting post,Admin. It is always great to just wander slowly and take notice of the buildings above shopfronts and businesses. If I can spot an old advertising sign or a piece of rather over ornate brickwork or even a fancy parapet, it makes up for the occasional stumble because I’m not looking at the pavement! 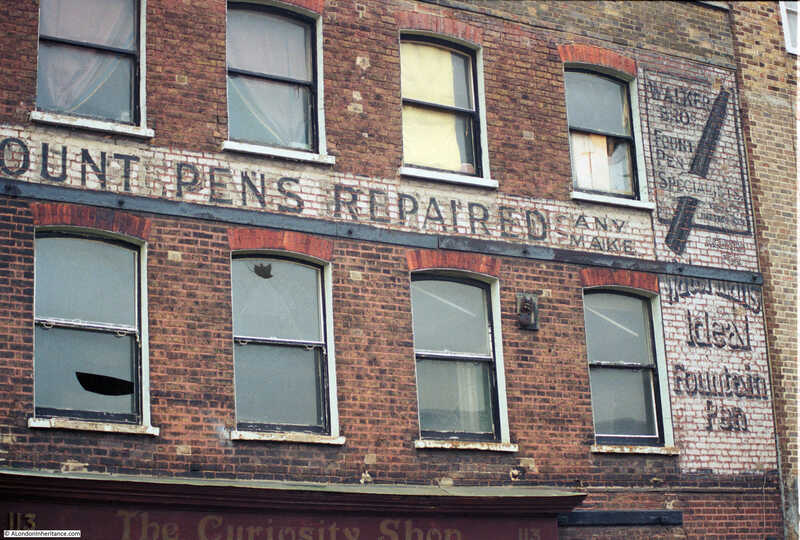 Fount pens repaired any make – Stoke Newington Church Street. It is still there! I stumbled across your blog a few weeks ago by chance; I’m so glad I did. 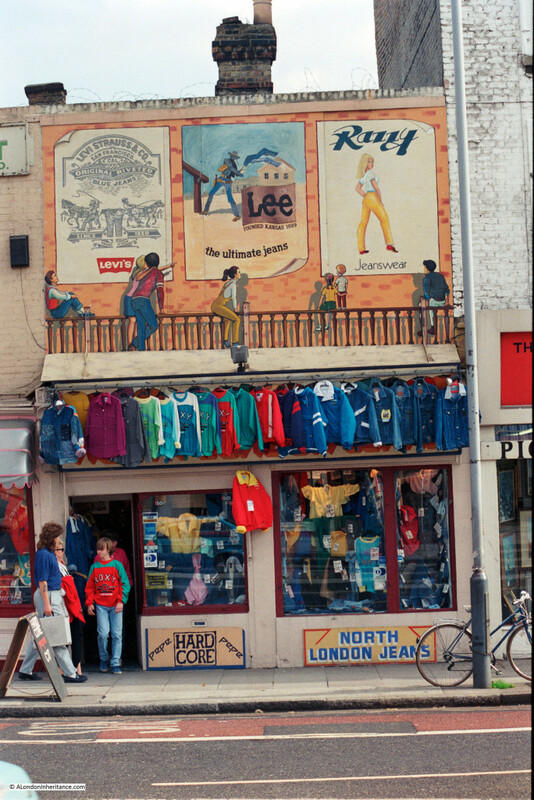 Wonderful pictures of shop fronts in areas that I knew so well in the 80’s. 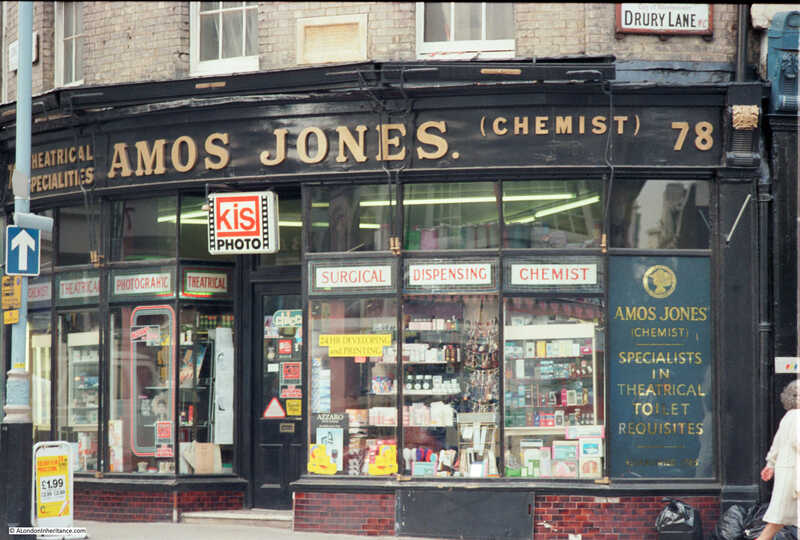 BTW does anyone know if the laboratory equipment suppliers (they may have been named Brick’s) on the eastern side of Stoke Newington High Street, just south of the station, still exists? It’s rare for any of us to be able to catch you out on anything but the B Flegg writing is still in Monmouth Street. One of the simple joys of wandering around town is the number of old wall advertisements still in place. Great stuff as usual. 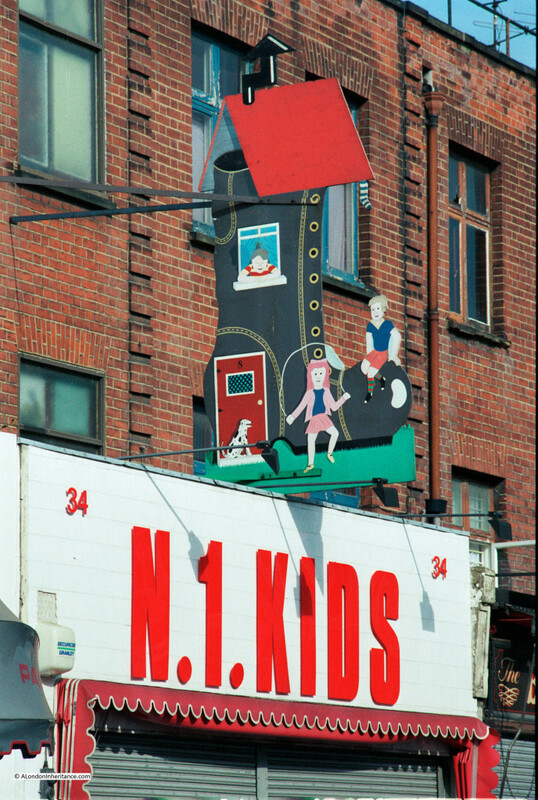 For those of us who collect ghost signs and old-style shopfronts these pictures provide exquisite torture. At least some of them are still extant, though. 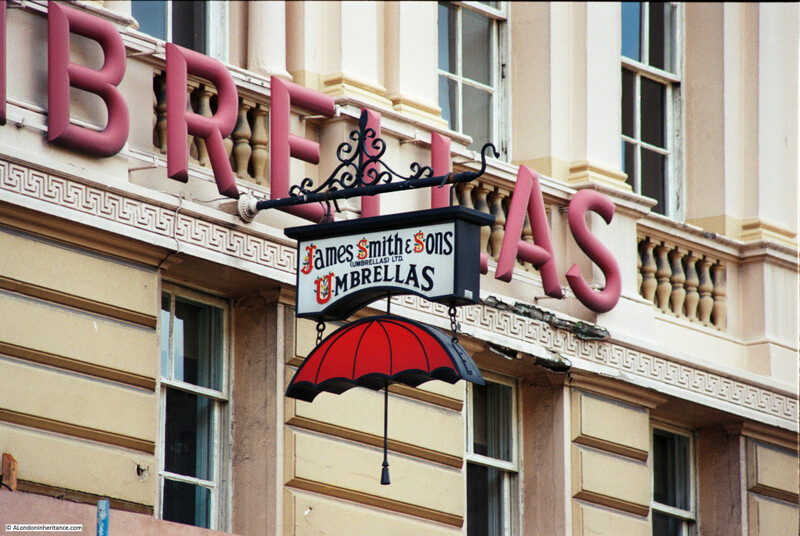 I walk past James Smith umbrella shop nearly every time I’m in London. 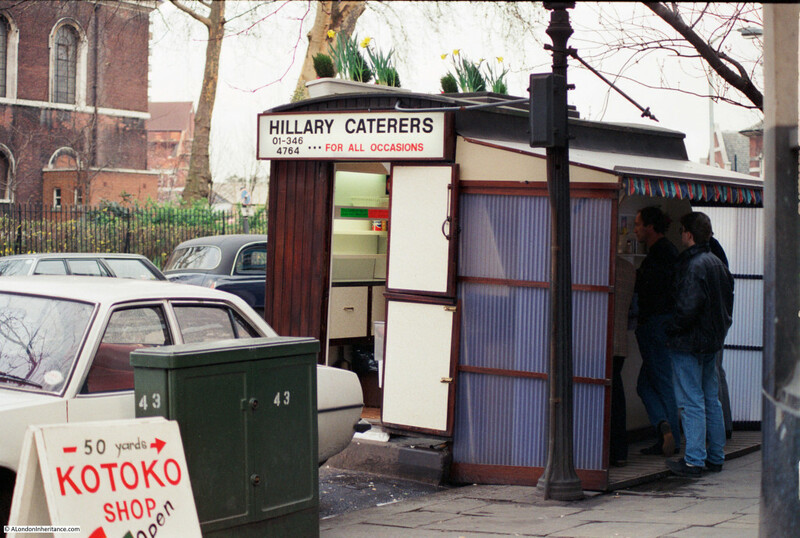 And I’d no idea that the coffee stall I’ve seen just off Shoreditch high street has such a pedigree. Fascinating. Albert France were the funeral directors for Nelson after the Battle of Trafalgar. The funeral was on 9 January 1806 at St. Paul’s Cathedral. Another great post and the last paragraph sums up how I feel about the great city! Also you have included three of my favourite places Cornellissens artists colour men, Smiths brolly emporium and Syds cafe…all brilliant! Thanks for posting these great photos. I believe S Krantz was still there until at least 2011, with a new blue frontage. G Smith seems to have disappeared in late 2011. The A France website says they have been at 45 Lambs Conduit Street since 1898. I see someone else has mentioned 41 Monmouth Street, near Seven Dials, with the tiles of The Crown pub next door. Also as mentioned above, the “fount pens” ghost sign is at 113 Stoke Newington Church Street, and the B Flegg one is still above at 67 Monmouth Street. The Swan Ink sign on Cambridge Gardens may have disappeared, but there is the remains of a painted sign on the diagonally opposite corner. It is rather faint, but the top panel seems to say something like “SAMBUCA”. Sorry, I meant to come back to mention that the shop under the tree on the corner of Cheapside and Wood Street has a long history. The tree is growing where St Peter Cheap (or Westcheap) used to stand. The church was destroyed in the Great Fire in 1666 and not replaced. The Eleanor Cross at West Cheap was nearby too. Apparently the parish was granted a licence to build a shop in front of the church wall on cheapside, in 1401! The tree is thought to be several hundred years old. The building at that time looks slightly different. 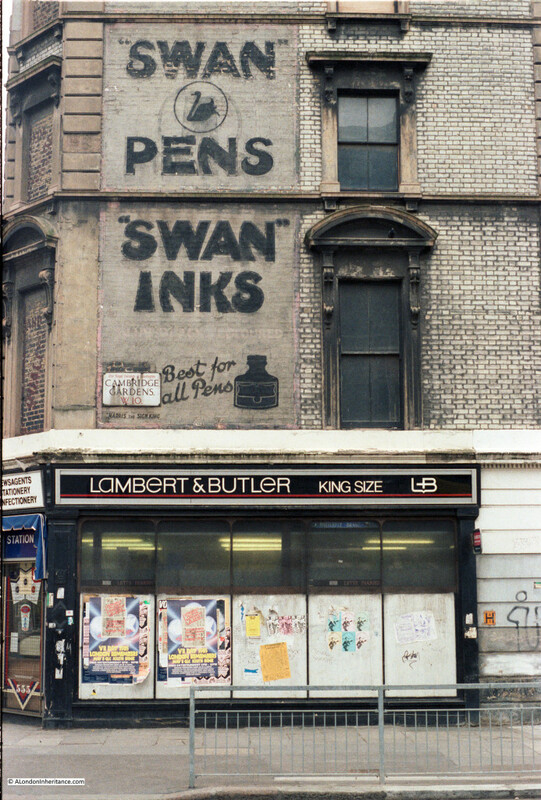 L. Cornelissen & Son was on Great Queen Street and the pub next to A France is The Crown. I do not recall that branch of France’s ever being open!